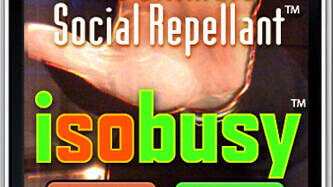 David Brier of DBD International in Menomonie developed IsoBusy, a new iPhone application. Everybody at some point or another would like to have an out, whether it’s from a boring meeting or an awkward social situation. David Brier of DBD International in Menomonie developed IsoBusy, a new iPhone application that allows you to prompt fake calls from your phone. Whether you get a call from your daughter making poor decisions on spring break or an awkward call from a restaurant owner upset about your inappropriate behavior last night, each call is a definite excuse to excuse yourself. DBD International developed the name, concept, and voice talent for the project and had a technology development company take care of the programming. There are quite a few “fake call” applications out there right now, but Brier said his was the first to have 23 pre-recorded calls that could all be considered funny. “We saw that there were fake call apps, but there wasn’t much in the way of entertainment,” he said. IsoBusy just came out, but it’s already the best-ranked application of its kind. Brier said because most applications only have their technology developers behind them, the app will do well. DBD International is planning a series of fake commercials to put on youtube.com to get the word out. “Our ads are kicking the other apps’ butts,” he said. “We bring to the table all of our branding smarts.” Brier said he hopes IsoBusy will be successful and would love to see the app make it to the top 10 list.